For many Australians summer-time is synonymous with long enjoyable days at the beach, and out of all the fun activities that one can indulge in there, surfing is perhaps the most iconically Aussie of all. Surfing has been an intrinsic part of our way of life since a century ago, when Duke Kahanamoku, a Hawaiian Olympic champion, introduced the sport to Australia, and these days even very young children are learning the basic moves in various surf clinics around the country. Teaching youngsters from 5 – 12 years old, Vegemite Surf Groms is a nationwide training program that encourages kids to get involved in surfing. Available exclusively through licensed Surfing Australia surf schools, the program involves a series of surfing lessons that encompass about 8 to 10 hours of tuition in total. To cater for age and developmental differences, classes are available in two categories: Mini Groms for littlies from 5 – 8 years old and Super Groms for older children, from 9 – 12. There are various skill levels in both groups and as the children hone their surfing skills, they graduate to more challenging tasks. As well as receiving qualified coaching from experienced surfers, every participant in the Surf Groms program receives a free Quicksilver or Roxy backpack, full of cool stuff including a sun-hat, rash vest, Nikon voucher, wax comb, jar of Vegemite and a Vegemite Surf Groms log-book for keeping track of their development. In addition to the practical tuition, children are also taught to recognise various surfing conditions, potential hazards, surf survival, basic rescue skills and basic first aid – skills that are also invaluable in the wider world, far beyond the beach. As with all good children's tuition, parental involvement is welcomed and if you go to the Surf Groms website you'll find a load of information about the program and its learning objectives. Here in Perth the Surf Groms program is available throughout the warmer months at a couple of top locations: the Surfing WA Surf School at Triggs and the Big Wave Surfing School at Secret Harbour. For wannabe surfers in regional Western Australia, there are also programs held at Little Seeds Surf Coaching in Albany and the Midwest Surf School in Geraldton. 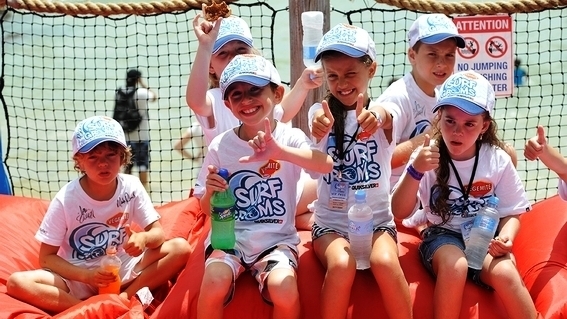 In conclusion, if you've got a young surfing enthusiast in the family or are looking for a leisure program with a difference for your kids this summer, the Vegemite Surf Groms program may be something you'd like to check out. As well as learning a great new sport, children will imbibe many useful practical skills, have loads of fun, and develop terrific new friendships. To find out more, go to the Surf Groms website or follow the links to the websites of the specific surf schools mentioned above. Why? 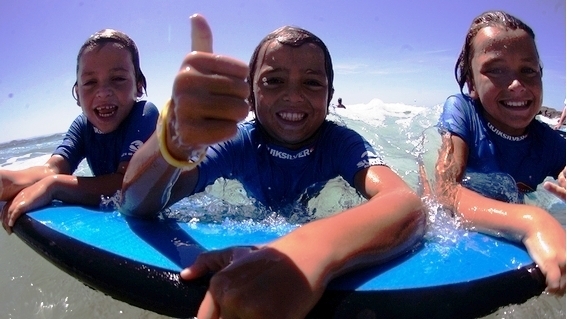 Surfing is fun, healthy and kids love it. Where: At various locations in Perth and regional Western Australia. Cost: Prices vary from centre to centre. However, they start at $120 plus a one-off $25 membership fee.